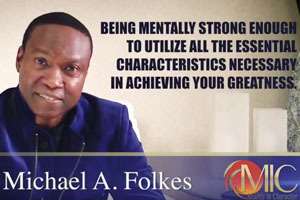 "Being mentally strong enough to utilize all the essential characteristics necessary in achieving your greatness." Mighty In Character also means a strong, powerful essence and spirit. It also means doing all that you know for a fact, to be good and true while remaining humble yet firm in your beliefs. Living MIC is placing a strong emphasis on working with children to nurture and develop their best qualities, to ensure that our future leaders reach their full potential. Living MIC is also providing a second chance to deserving adults who have made mistakes in the past, but who now wish to contribute to the betterment of our society. This ensures long-term prosperity for the community, the country and the world. Mighty In Character is built on seven fundamental elements: truth, faith, courage, kindness, gratitude, humility and courtesy. Fear can be the executioner of all great hopes and dreams. Go above and beyond what you've already mastered; until you push yourself to your maximum limit you will never know what you're capable of....be courageous! Know enough to be confident, still be wise enough to remain humble but firm in your beliefs. Sometimes however, you must lead instead of being led. But always humble yourself! Without mutual trust and admiration in any relationship you will have nothing but false pretense and emptiness. There's no shame in being truthful! Be grateful for your adversities, challenges & difficulties. See them as opportunities to grow. To know who you are, is to know where you came from. Be thankful of your accomplishments and where you are going. Start seeing your cup as half-full instead of half-empty! Allow the humanity in us to understand greed, jealousy and envy, then allow our attitude, actions, kindness, caring and sharing to sustain the interdependence and coexistence of our humanity. Show a little compassion! Faith is a matter of choice; you can choose to believe in it or you can choose to abandon it. However faith is fundamental in every human's life. First believe in yourself and develop the determination and confidence required to succeed even when the odds are sometimes stacked against you. Sometimes you must forget the status quo and exercise your faith! Do not be boastful or consider yourself better than others, remember your beginnings and the contributing factors that allow you to become who you are today. Express a friendly smile towards others and work wonders making this world a happier and better place!